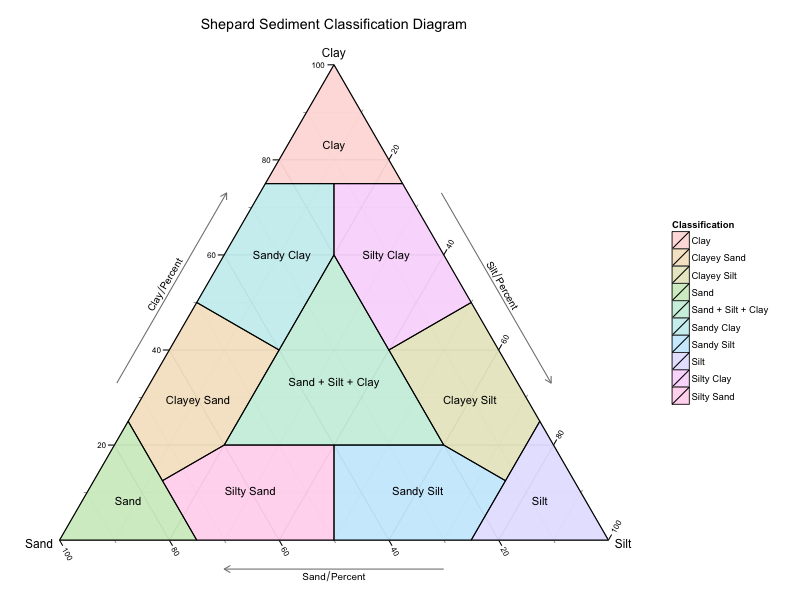 I received a request overnight on how to render the Shepard’s classification diagram, which is an alternative to the USDA’s textural soil classification. This is quite simple to produce (albeit a little tedious), however, before I walk through the script, immediately below, please see the final result (which you can compare to an original). Firstly, we need to create the dictionary of points. Assign each polygon a unique number and respective label. Now we merge the polygons, points and polygon labels to create a master dataframe. #Merge the three sets together to create a master set. We also create a separate data frame for the labels positioned at the centroid of each polygon. This concludes the data preparation step. Now we can build the final plot, which employs the geom_polygon(…) and geom_text(…) geometries and the above data-sets, we apply some transparency so the grid can be seen through the polygons, and base the drawing of the simple theme_bw(…) arrangement. Finally, if one likes, we can also render it directly to an image. To download the full script, please click HERE. Anyway, thanks. Seems like I could use this. Have to look at your site to understand how to put int he values in the end. Never considered plotting my soil data into this via R, for some reason. Strange, isn’t it? Is there any simple way to change the filling colors manually? I’m new to ggtern. I’ve managed to make the diagram following your code (great stuff!!!) but I’m having trouble plotting my points on top of the diagram. I have a series of soils for which I have the clay, sand and silt %’s but can’t figure out how to plot them on top of this diagram. If you could lend a hand or point me into the right direction I would appreciate it a lot. Leandro, most of the basics for ggplot2 work for ggtern. Using ‘base’ as the last plot from the script above, add some random points via local data.frame to a new geometry layer. I try to apply a ‘stat_density_tern()’ script to ‘newPoints’ but it’s applied to ‘base’ instead. I try to apply a ‘stat_density_tern()’ script to ‘newPoints’ but it’s applied to ‘base’. 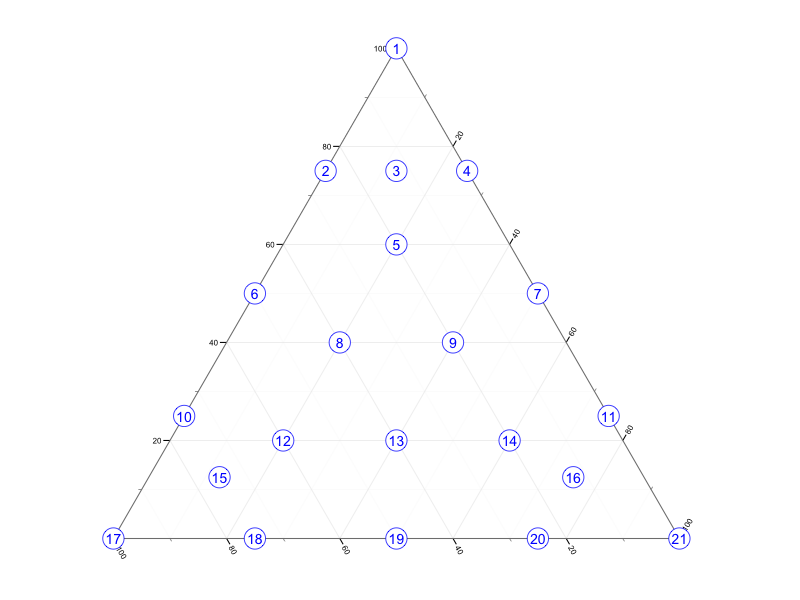 However, in ggtern 2.1.4, running the code for the first figure results in a figure that looks different: points on the edges of the equilateral triangle are cropped. Turn the clipping mask off (theme_nomask()) or put the clipping mask (geom_mask()) UNDERNEATH the points layer. I’m relative new with rstudio and ggtern and was wondering if you could help me figure out how to plot my own points on your Diagram. I have my own data set that I would really like to plot, but I keep getting error massages about not recognizing the Z aesthetics. Any help will be greatly appreciated. I’m Trying to get a plot with only 4 areas (triangles). But I can’t manage to get the center area. I am trying to get a plot with 4 areas (triangles). I can’t manage to get the center area. I am trying to get a plot with 8 areas. I can manage to get 7 areas but the last one doesn’t work.